Israeli soldiers abducted, on Wednesday at dawn, at least thirteen Palestinians from their homes, in several parts of the occupied West Bank, the Palestinian Prisoners’ Society (PPS) has reported. The PPS office in Nablus, in northern West Bank, said the soldiers abducted Moath Thouqan, the son of imprisoned university lecturer Ghassan Thouqan, from the city, and Hasan Bakheet, from Balata refugee camp, in addition to Sameh Hammad Mansour, from Kafr Qalil village. In Jenin, in northern West Bank, the soldiers abducted Ali Taiseer Zakarna, 20, from Qabatia town, south of the city. Furthermore, the soldiers installed many roadblocks around villages and towns in Jenin governorate, before stopping and searching dozens of cars, and interrogated many Palestinians while inspecting their ID cards. The soldiers also invaded Birzeit town, north of Ramallah in central West Bank, searched homes and abducted Issa Eyad Shalalda. In Bethlehem, the soldiers searched several homes and abducted Farouq Abu Aker. 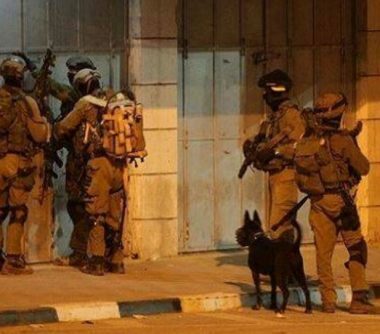 In Hebron, in the southern part of the West Bank, the soldiers abducted Ziad Banat, in addition to Omar Mohammad al-Heeh, from Surif town, north of the city, and Ziad Nawaj’a, from Surif town, north of Hebron.